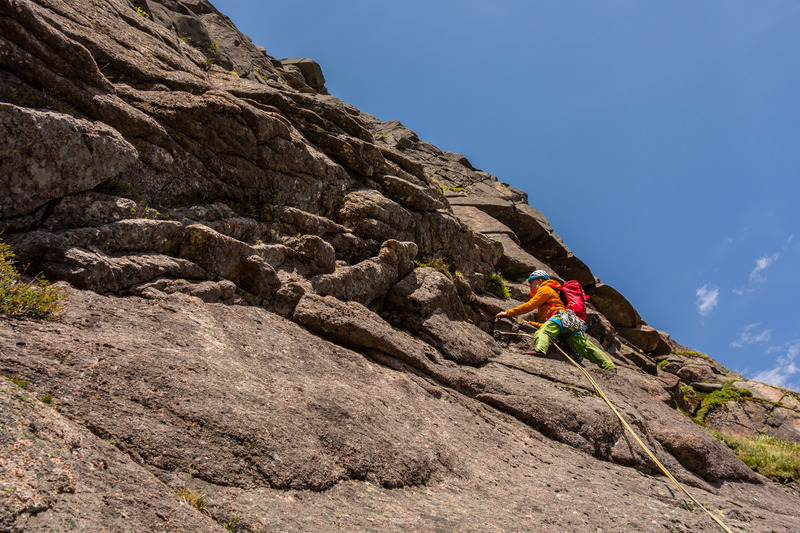 Cool, breezy weather with some sun in prospect meant that the south-facing and quick-drying crags of Stag Rocks were a good choice last weekend. Despite the route’s reputation, The Sandpyper Direct (HVS), with its bold slab climbing and devious line proved too hard to resist for Ric, Andy and myself. The eastern side of Stag Rocks with Longbow Crag to the right of the obvious Amphitheatre Gully. The Sandpyper Direct heads up the cleanest area of slabs. 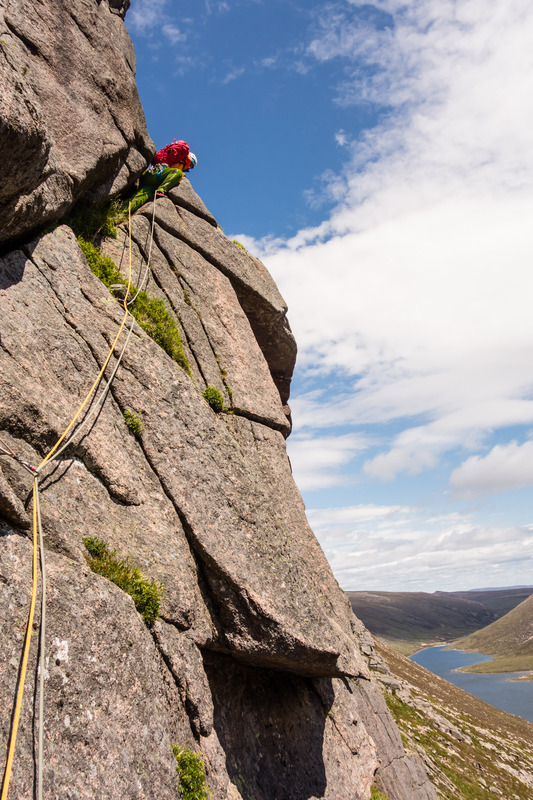 The wind was clearly stronger than forecast and combined with the chilly air we found ourselves gearing up in all our layers and gloves – classic Scottish summer rock conditions then! 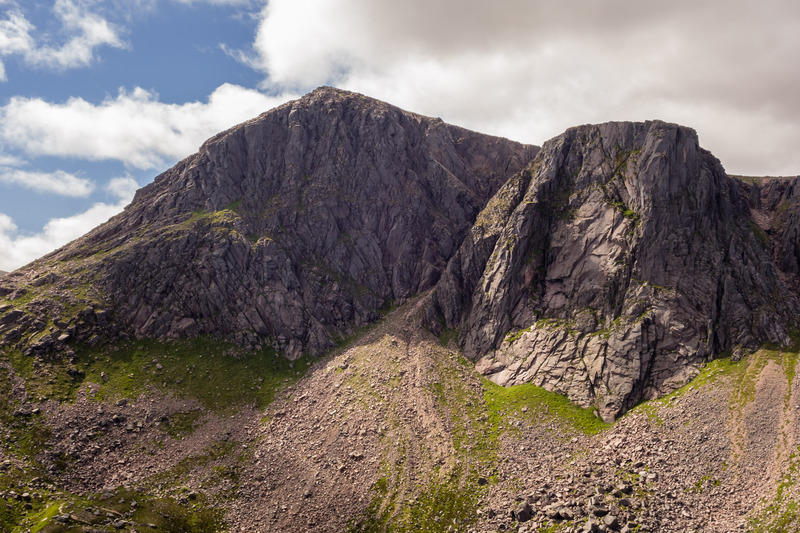 The views throughout the Loch Avon basin were as stunning as ever and it was great to look over at the Shelterstone and remember our ascent of The Needle a month prior. 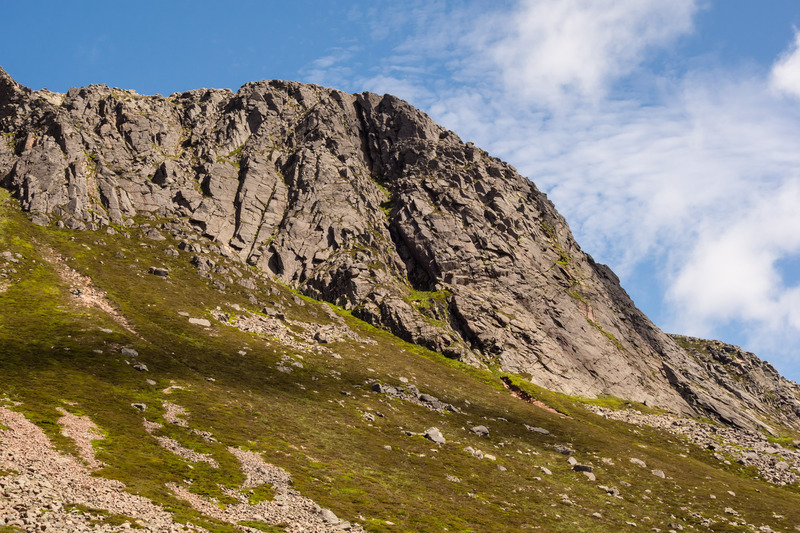 The spectacular and intimidating Carn Etchachan (left) and The Shelterstone Crag (right). Teams in action on Steeple and The Needle despite the cold weather! 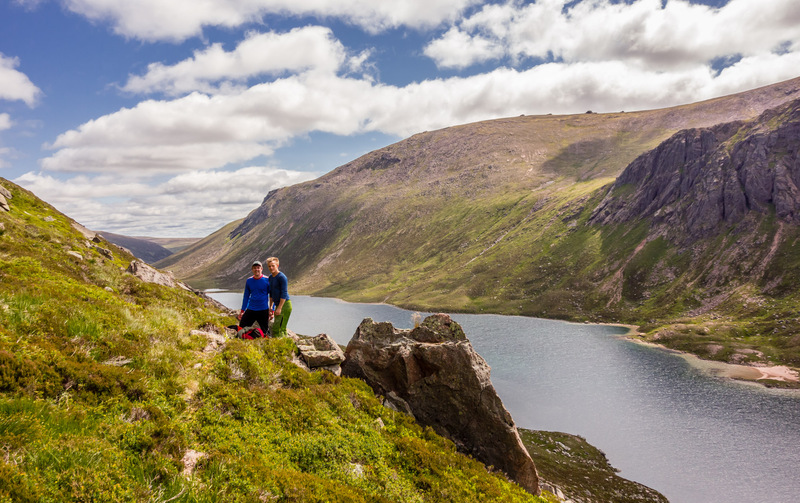 Gearing up at the base of the route in a stunning location – Loch Avon and Beinn Mheadhoin beyond. Coats and gloves were swiftly donned! Bold slab climbing is Ric and Andy’s forte so I had no qualms with the boys dispatching the lower part of the route. 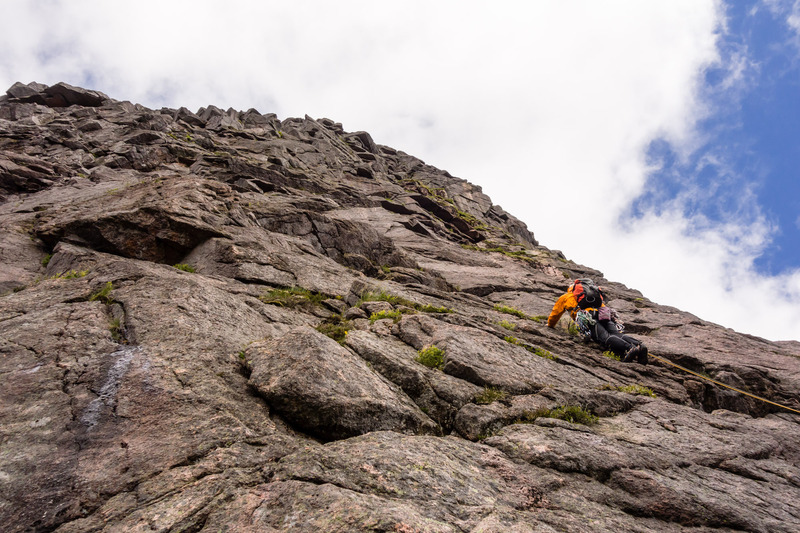 We chose to lead in blocks of two pitches to minimise the phaff at belays associated with climbing in a three. Ric embarks on the near-gearless first pitch of Sandpyper Direct, luckily it’s very straight forward! Ric at the start of the second pitch which heads up and left from here to climb the slim right-facing groove. There were a handful of runners. 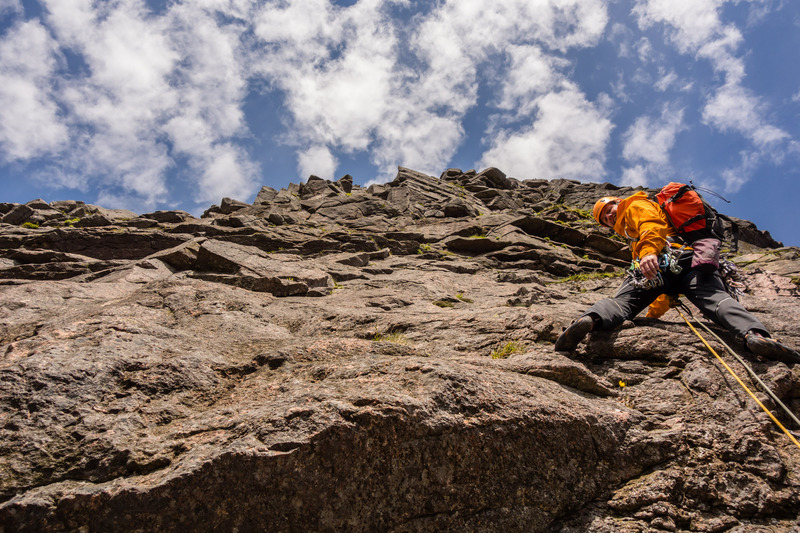 The climbing is never difficult but it is very serious. We were expecting the odd run-out section but the guidebook does not really convey the degree to which this route demands a careful and steady approach. 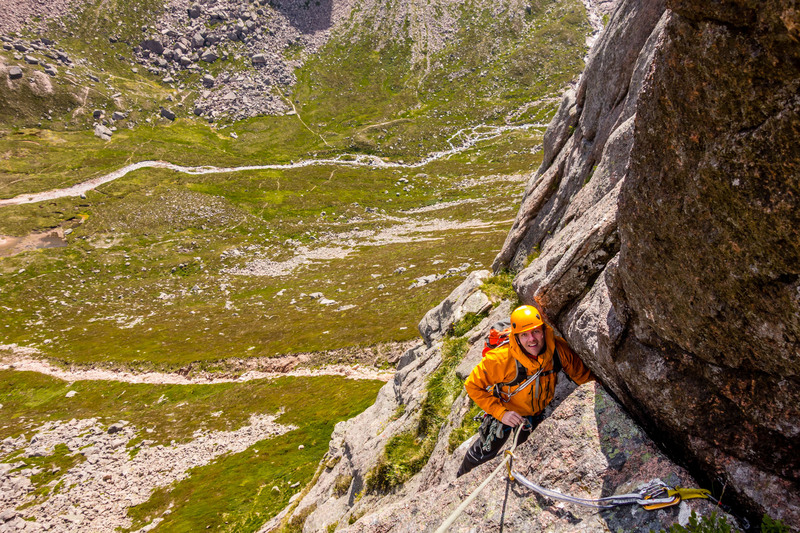 The third pitch in particular involves a tricky pull over an overlap someway above and right of the belay, with protection coming from a single crucial runner. Andy after the first traverse on the scary third pitch. He surmounted the overlap slightly up and right of where he is now after placing the crucial single piece of protection – a no. 2 Camalot. Unfortunately the leader of the team below us missed the runner placement and despite our efforts to supply a top rope from above she took a nasty fall attempting the mantle through the overlap. Miraculously, given the size and pendulum nature of the fall, she didn’t sustain any serious injuries and the party were able to descend and walk out. Andy on the very exposed but enjoyable traverse out right at the start of pitch 4. The traverse back left above is substantially harder and it’s critical the second’s are protected. Pitch 4 contained the best climbing on the route but after witnessing near-tragedy mine and Ric’s nerves were shot. We cautiously followed Andy’s excellent lead, zig-zagging our way across exposed and precarious traverses to end up at a semi-hanging stance beneath a final steepening. Ric following on the first traverse of pitch 4, trying to remain positive after witnessing a nasty fall below us. We contemplated abseiling off, but reasoning that getting our heads together for one final hard pitch was the lesser of two evils, Andy valiantly agreed to lead us out. A few stiff pulls and some corner-crack climbing saw us at the top of the difficulties and wanting to contribute something to the team I led us up three easy pitches to the top of the crag. I was subsequently contacted by the lady who fell and apart from being a little bruised and battered she’s okay! Thanks Andy, that’s good to know!